Fat Tuesday was a combination of reasons why I made this dish. 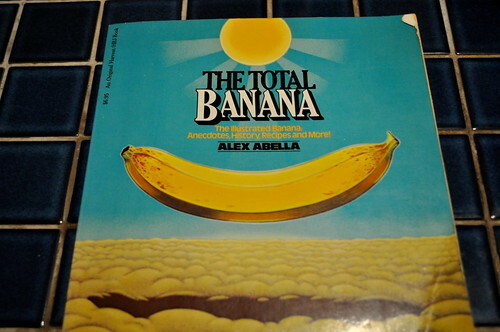 Ian, with the help of Tim, got me this ridiculous cookbook for Christmas, The Total Banana. And ever since, we’ve been talking about having a banana dinner night. After thumbing through the banana book, I found “Chicken Gumbo” (with plantain balls) and Fat Tuesday was only a couple of days away. A few text messages later the banana dinner was in place! 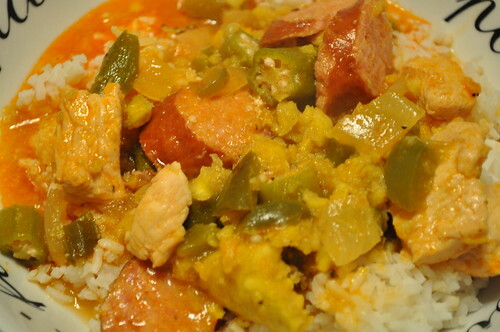 I picked chicken gumbo from the book because it seemed to be one of the easier things to make. I thought to ease myself in to the Total Banana. The recipe called for okra and I’ve never worked with okra before. I did not prepare it the best way possible and it was a little bit slimy. Not in a gross way, but a definite acquired taste. A better way to use okra is to fry it up and add it at the end, almost like a garnish to your dish. I will definitely go that route next time I use okra. I do not have the recipe on hand currently. Tim has The Total Banana, since we decided that we should take turns hosting the banana dinner. Tim is unfortunately next. 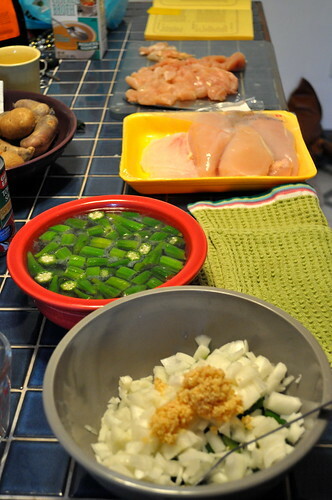 It was a pretty straight forward recipe with green peppers, onions, garlic, chicken stock, okra, spices, etc. I added sausage into it to give it a little more oomph. My coworker gave me some southern cookin’ staples and I added gumbo file at the end. Deeeelish! Once I get the banana book back, I will update with the recipe. So I don’t remember exactly where I found this recipe but I’m glad I stumbled upon it. The recipe itself says this dish “has all the taste of pizza without the guilt.” I don’t know where the pizza part came into play because it certainly doesn’t strike me as a pizza alternative. What I will say is that it is YUMMY. Preheat the oven to 350. Heat a large ovenproof skillet over medium heat and spray with the nonstick spray. Season the chicken on both sides with the salt and pepper. 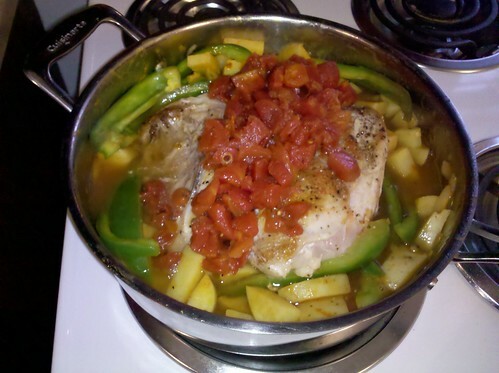 Saute the chicken breasts until browned on both sides. Transfer the chicken to a large plate and cover. Add the potatoes, onion, peppers, oregano, and pepper flakes to the skillet. Saute for 10 to 15 minutes, until just tender. Add the tomatoes, tomato paste, and broth. Bring it to a boil, and remove from the heat. Add the chicken breasts to the skillet, cover tightly, and place in the oven. Bake for 45 minutes, and serve. I was pleasantly surprised at how well this dish came out. Serving it over rice, or even pasta, is the best way to enjoy this so you can get all of the juices as well. So simple and yummy! i call this my “30 minute pasta salad” because it only lasts 30 minutes when you take it to a cook out. double the recipe if you know there will be a lot of people or a couple hungry people. i’m serious, this stuff will go! boil the gemelli in a pot of salted water for about 9 minutes and strain. while the pasta cooks, chop up your peppers, cucumber and pepperoni. this is what i normally put in my pasta salad but if you have anything else you’d like to throw in, throw it in! put all of the chopped veggies, pepperoni and olives in a big bowl. add the strained pasta and pour in 1/2 a bottle of Wishbone Robusto Italian dressing. sprinkle in the 2 tablespoons of Salad Supreme and toss again. cover and put in the fridge for an hour or so. this is best served cold. do not skimp on the Wishbone. don’t buy the cheap knock off. i’ve done it before and it just does not taste the same. i’ve tried Wishbone’s Zesty Italian dressing and it is the best substitute if you can’t find Robusto. and DO NOT skip the salad supreme! there is something about this seasoning that makes this salad amazing. 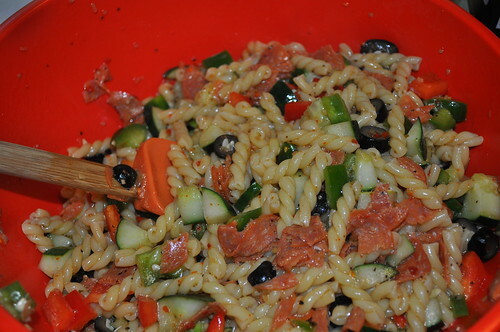 if you don’t believe me, invite me over to your next cookout and i’ll bring the pasta salad. you’ll thank me later.